Well, I did a test run for almost a year. I had both an Etsy Shop and a Website. I found it hard to keep both updated regularly. It was just a matter of time before I picked one over the other. I was still thinking maybe I should keep my website . . .and then a new customer bought 16 items from my Etsy shop yesterday. Thank you very much by the way! I'll take that as a sign, LOL. Etsy wins! It is certainly demanding having multiple stores. Listing on Etsy with the odd eBay listing seems to work well for me. Tomorrow I will be transferring my website inventory over to Etsy. I think these vintage dresses will do well there. On another note . . . this will be a busy week. My dog Cider will be having her leg operation on Tuesday morning at 8:00am. I am more worried about the after-care than the surgery. I hope she leaves the stitches alone. My niece is having her wisdom teeth pulled on Thursday morning. She is attending a local University (her family is in New Brunswick) so I will be her designated driver and caregiver afterwards. I joked that she and Cider can share the couch together (chipmunk-cheeks and lampshade-head recovering together). Stay tuned! Karen, I hope Cider's surgery will go well and she will make a great recovery after. I will be thinking of her. Sending love to you sweet Cider. Hope Cider will be better soon, Karen!Kim and I send kisses her way! As for the shop... well, I understand, as I have just opened a Etsy shop and a parallel Boutique (by the way, please come to have a look!). I'll do my test, too! Can't wait to see the gorgeous dresses listed! 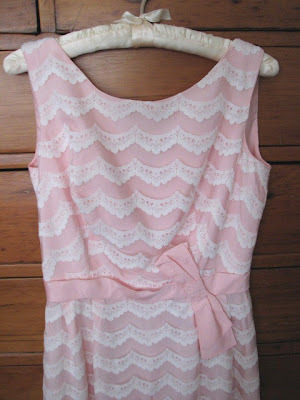 Love the pretty pink frock and want to wish you all the very best with your Etsy shop. I will be thinking of you and Cider on Tuesday, I hope that the surgery will go well. Dogs really don't like that lampshade look especially if they think people are laughing at them. Also your neice with her wisdon tooth, I hope that goes well for her. Woo hoooooo on the sale, if that isn't a sign, then what is? Love to your dog Cider, I know what you mean about the after care, our little Cooper is having his surgery in a couple of weeks and I am not looking forward to it. I can just picture Cider and your niece looking like that together on the couch! Hi Karen, thanks so very much for popping over to visit me at my blog. Wishing Cider well with her surgery, our dogs are such a huge part of our family arent they? congrats on your sales at etsy...that is wonderful that you are selling so well there!!! i do love that little girls organdy dress in your shop...so sweet!!! First of all, thank you for leaving such a nice comment on my blog! 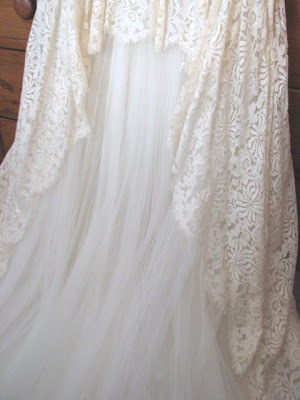 I love the 2 beautiful vintage dresses! Especially the creamy one ( and I'm not the only one I read!). I hope your dog will recover soon! That dress! Wow! Looks like something I could lie down and take a nap with! Isn't it funny how every once in awhile someone will totally wipe out your Etsy shop? I've had it happen twice...and they don't say a word either...just shop and leave. Fun! Hi Karen...Oh, I hope Cider will feel better after the surgery. Love your "lampshade head" comment...you do have to see the humour in all of this! Oh, I love that cream dress...I should have been paying more attention...wah! Thank you! Off to the vet in about 40 minutes. I'm chicken now too! My dog is very fearful at the vet. I hope they give us both anesthetic as soon as we walk in! There is mandatory blood work before they start however.